Crock Pot Salty Sweet Candy is an easy to make dessert everyone loves! Just throw everything in your slow cooker and you’ll have treats for everyone on your nice list! The holidays are here and boy did they sneak up on me. With so many things going on it can be hard to fit everything in. From shopping to parties to making those yummy cookie trays, where do you find the time? 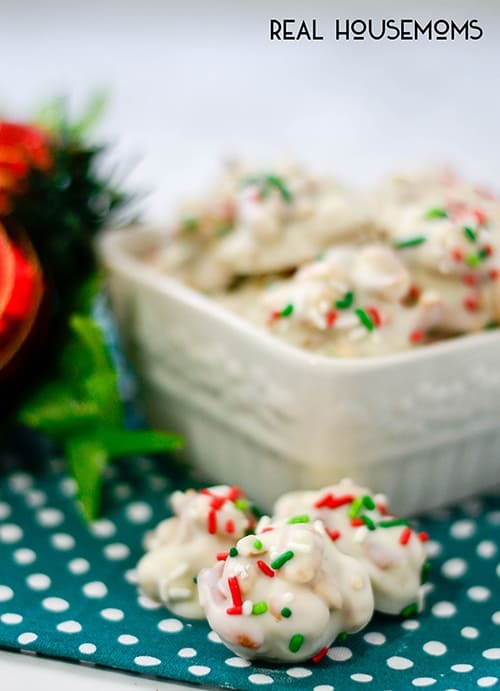 This Crock Pot Salty Sweet Candy is one of my go-to holiday treats. It’s crazy easy to make and everyone loves it. It’s a great food gift for neighbors, a yummy addition to any cookie plate, and a perfect poppable treat for your holiday party! CROCK POT SALTY SWEET CANDY! My family loves to make and receive cookie plates. We have about 20 families we like to deliver treats to each holiday season. 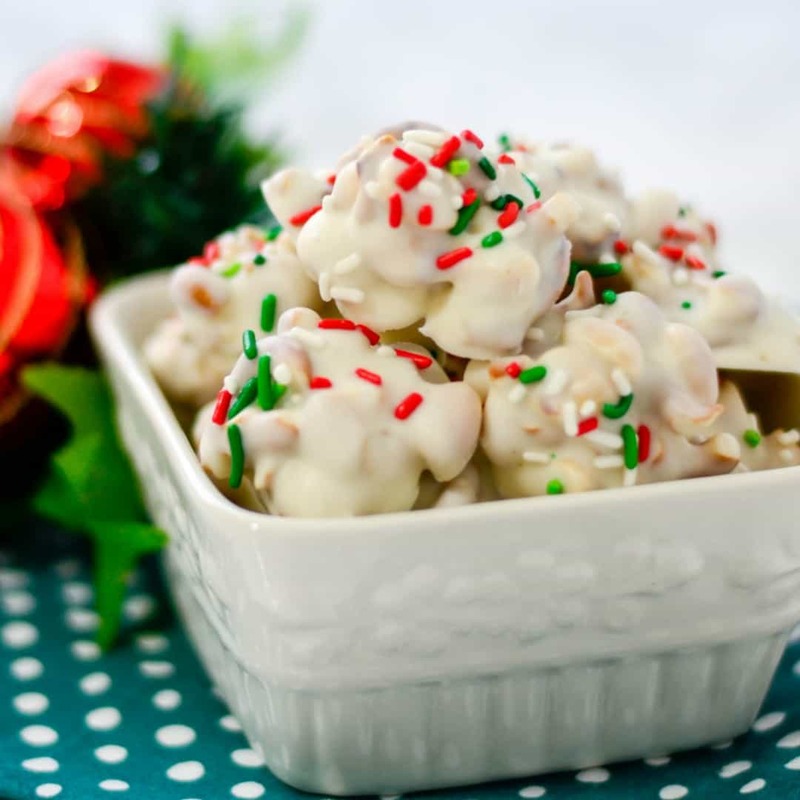 One recipe I can always count on is Crock Pot Candy. This year I went with a white candy instead of my regular milk chocolate. 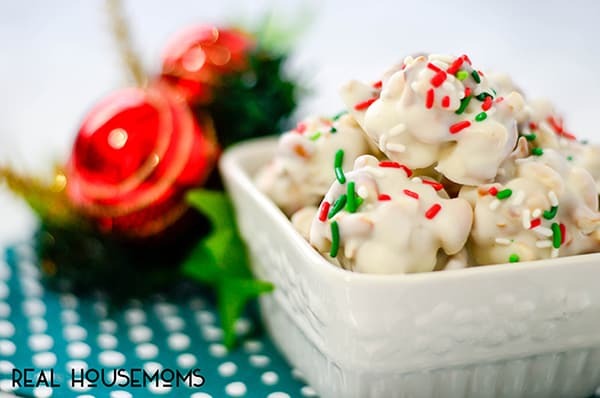 This is one of my family’s favorite Christmas candy recipes and it makes a HUGE batch! I just took the chocolate recipe and replaced the milk chocolate with white chocolate. It works great! Now some like to use unsalted peanuts in this dessert, but I really like to use dry roasted peanuts they have a slightly salty coating to them for this candy. The pretzels aren’t too salty either and work perfectly. I am a huge fan of all things salty and sweet. I would love to say this is a “dump it and forget it” kind of recipe but because we’re working with chocolate and candy it requires a bit more attention. That being said, you can put the ingredients in your slow cooker and leave them for an hour to do other things! I usually set a timer because I don’t want to forget the candy in the crock pot and ruin the whole batch. Then, I used a small cookie scoop to portion the candy onto parchment paper (a silicone mat works fine too). And because I can’t leave things alone around Christmas, I put sprinkles on to make them extra festive! This really is the easiest crock pot candy recipe! If you loved this recipe, be sure to try some of my other best crock pot recipes. They’re sure to be a hit with your family! Want more easy bite-sized dessert recipes? Crock Pot Salty Sweet Candy is an easy to make dessert everyone loves! Just throw everything in your slow cooker and you'll have treats for everyone on your nice list! 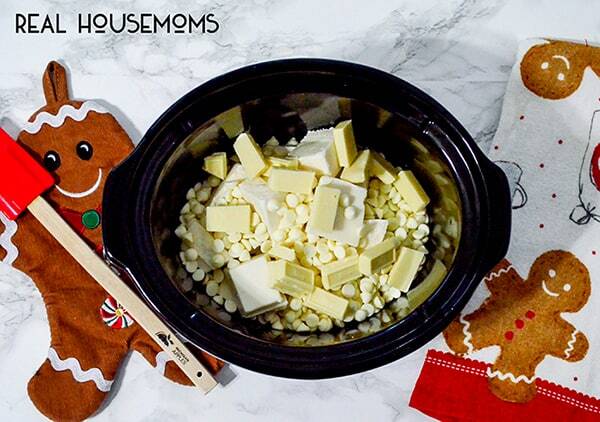 Place white chocolate candy coating, white chocolate baking bar, white chocolate chips in a crock pot that has been set on LOW. Heat candy for 1- 1-½ hours until melted. Uncover; stir the chocolate mixture. Stir in peanuts and broken pretzels until completely coated in the candy. Drop by spoonfuls (i like to use a small cookie scoop) onto a baking sheet lined with parchment paper or a silicone mat. If desired, top candy with sprinkles. Allow candy to set for at least one hour. 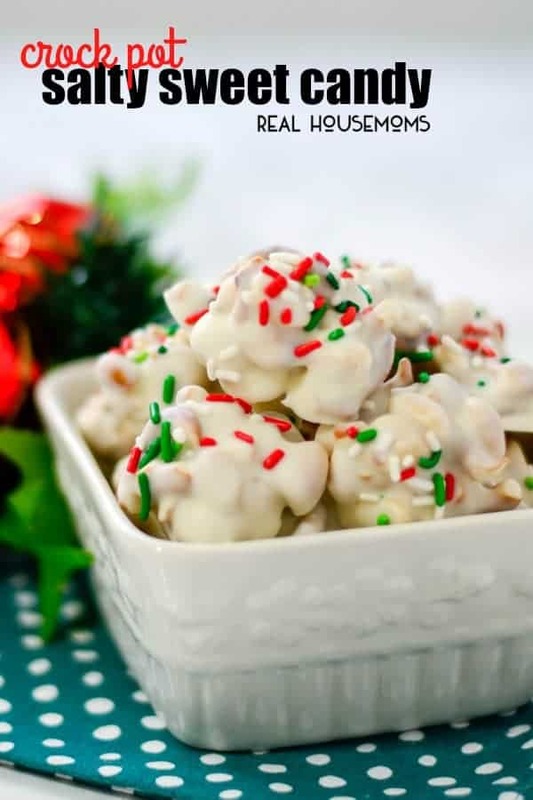 If yyou’relooking for more recipes for Christmas Candy you might like this one. What is white chocolate candy coating? Hi Stephanie! White chocolate candy coating is a vanilla candy, like CandyQuik or Almond Bark. Wilton makes this product too. You may get a little bit of condensation on the lid, just remove it straight off and don’t tilt it over the crockpot it shouldn’t be a problem. I make many deserts in my crockpot. I put a paper towel first, then the lid. This will cut down on the condensation. If you choose to freeze you will just want to go through the process of laying them out on a cookie sheet lined with parchment paper. Freeze for a couple hours then transfer into a bag. They should keep for about 4 months frozen or up to 5 days in the fridge. Could you use walnuts or almonds instead of peanuts. Certainly, if that’s the flavors you prefer. Try toasting them for a few minutes in a pan first, it really brings out the flavor! What is the difference between almond bark and a baking bar? Thanks! Almond bark (also known as vanilla flavored candy coating) is a chocolate-like confection made with vegetable fats instead of cocoa butter and with coloring and flavors added. … The confection is commonly used to cover or dip fruits, nuts, cookies, or crackers, in place of real chocolate. Can you use milk chocolate instead? Yes candy melts can be used! Can you do this with milk chocolate? If making these ahead of time to traywith what is best way to store them ? In the fridge, helps so they don’t melt. You can line a cookie sheet with parchment paper if you’d like. This was delicious and it did make a huge batch!! How long will this stay fresh if kept in the fridge? If you think they will last long enough, you can get about a week in the fridge. is it necessary to use 3 different kinds of chocolate? It works best with all three types. They each have a different level of fat in them which helps to coat and keep it in “candy” form, as well as melt in your mouth. It really does make a difference! Does this candy freeze well? Yes if you follow the traditional freezing process. 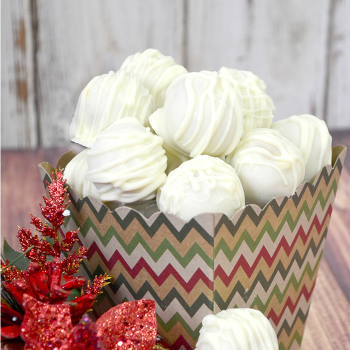 What Is the reason for all the different kinds of white chocolate? Can you just use all chocolate chips? You can make these up to 4 days in advance, they will usually keep in the fridge that long…. well that’s if your family doesn’t get to them first! If I make this in advance how long is it good for? You can get approx. 5 days in the refrigerator, if you choose to freeze you will just want to go through the process of laying them out on a cookie sheet lined with parchment paper. Freeze for a couple hours then transfer into a bag. If you are making this with regular chocolate what would you use instead of the white chocolate candy coating? I would like to make this with regular milk chocolate. Is this candy good to make ahead of time for Christmas? What is white chicolate baking bar? All I have is white chicolate bark. How long will they stay fresh in the bag? will it last a week f I make them today? Hi Pamela! They should, I’d keep them in the fridge so they don’t get soft and attach to each other. Amazing!!! I only made a third of the recipe as I didn’t want that large of a batch and now I wish I had made the full recipe. I have a feeling these are going to go really quick! I did let the chocolate go a bit long because I was baking something else but I was able to really scoop out the discolored (burned?) areas. Super easy and super delicious, I will definitely be making these again. Shared with my readers and pointed them here for direcitons. Thanks for the recipe! Wondering what size crockpot is needed? I tried making the chocolate covered peanuts in my 4 quart one time and it wasn’t big enough. Believe it or not 5 quart should be plenty. 6 quart is a great size to have on hand especially for social gatherings and would also work well. Do you have to use all three different types of chocolate or can you use just chips? You can use just chips, keep in mind it will change the taste and texture slightly since all three offer something different to add. I wasn’t able to find pretzel twists so I will use regular pretzel sticks for now. What about honey wheat twists? If you like honey wheat twists, you are indeed welcome to use them. We use the regular because they offer the salty-sweet flavors. These look super delicious! Would adding a bit of peppermint extract work with this? Sure, if that’s the flavor profile you would like to have. Use a very light hand to start, you can always add but it would definitely be tough to take away for this recipe. Sometimes the nuts can let off an oil, and adding them early could make it so the chocolate won’t coat everything nicely. Where do you find white chocolate candy coating and white baking bar? Do you use unsalted peanuts? All I care about is that they are dry roasted. Up to you whether you prefer salted or unsalted. You can control how much salt by even just doing half and half.